Of all the planets in our solar system, the two closest to Earth are Mars and Venus. Until sending exploratory probes past both planets and now sending landers on Mars, the sad truth has been made quite clear. The harder we search, the more evidence we find that we are quite alone in this solar system. Both Mars and Venus appear to us today as dead planets incapable of supporting life as we know it. That may not always have been true. Land rovers are now scratching their way across two sides of Mars, searching for minute traces of life, evidence that rudimentary life once existed, and water. Early excitement over unusual rock formations that some armchair astronomers speculated were signs of ancient ruins and reports of possible plant or fungal life seen at the poles turned out to be false alarms. Yet the probability that water and early stages of life once existed on the red planet have not been ruled out. In spite of numerous fly-bys, orbiters and a few successful landing missions to the surface of Venus, we have yet to take as close a look of this planet as we have Mars. That may be because we have yet to find any evidence that planet supported life, or ever will. Yet Venus has captured our interest because its make-up casts a closer resemblance to Earth than any of the other bodies in our system. This planet has a similar size and mass to Earth. It is closer to Earth than any other planet, and scientists believe it may have been formed from the same materials as the Earth. Some have speculated that if Earth has a twin sister, it is Venus. But alas, Mariner 2 and other Venus missions revealed that our “sister planet” is chemically different, and much too hot and dry to harbor life. The surface is covered by a heavy cloud cover that only allows about 20 percent of sunlight to reach the surface. Yet those clouds, consisting of a thick blanket of carbon dioxide, traps heat. Thus it is an extreme example of the greenhouse effect that now threatens Earth. One psychic suggested to us that if it was an alien that once manipulated the DNA of Earth primates to create the human race, it or its kind may have arrived from Venus. He noted that the so-called fallen angel Lucifer may have been involved. This angelic spirit has been identified as Lucifer, an ancient Latin name that means “morning star,” or Venus. He says the name may in itself be a subtle warning to us to avoid turning our planet into the uninhabitable hell such as once happened to Venus. If he is right, it implies that Venus once may have been a cooler planet, with oceans, an atmosphere and possible life. Author David Grinspoon, a research scientist at Southwest Research Institute, Boulder, Colorado, states in his book, “Venus Revealed,” that he believes Venus evolved from a wet planet similar to Earth to the scorching furnace it is today. He agrees that Venus might once have been an inhabited world. In a recent interview for Astrobiology Magazine, Grinspoon said he thought it possible that Venus once had oceans but that the water eventually evaporated into space over the course of about 600 billion years. The surface heat on Venus today is recorded at about 700 degrees Fahrenheit. The evaporation, Grinspoon believes, was natural on Venus since the planet is much closer to the sun than Earth. Only Mercury is closer. 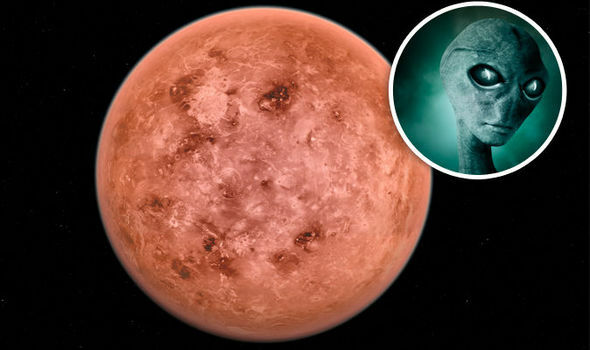 Another perplexing discovery about Venus is that the surface of the planet appears to have been covered by some new material sometime between 600 and 700 million years ago. Grinspoon said this information was uncovered during the Magellan mission to Venus in the 1990s. Was it volcanic activity, or did something else happen to Venus? Until the day comes when we can examine the planet up close, we may not know the answer to this puzzle.